Netflix 4K streaming to launch on next-gen 4K TVs at CES | What Hi-Fi? Netflix will begin streaming in 4K Ultra HD in 2014 with the launch of a new Netflix 4K streaming app on the next-generation of 4K TVs. 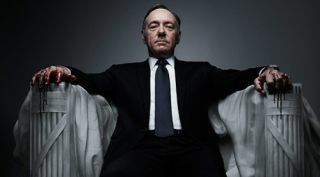 Netflix has confirmed it will stream House of Cards season 2 in 4K on the compatible TVs, while also revealing there will be some additional content available in the UHD format. Speaking to Stuff.tv, Neil Hunt, Netflix chief product officer, said: "We're not naming specific manufacturers, but we have several of the major TV vendors who are going to be producing 4K capable TVs – they'll be announcing them at CES." And it will be the Netflix smart TV app that will deliver access to 4K Ultra HD video, and not the Xbox One or PS4. "The new consoles may eventually be 4K-capable... but right now we're talking about 4K Netflix built into the smart TV", said Hunt. The lack of 4K content has been a concern, with Mastered in 4K about as close as we've got in the UK. Sony has launched a 4K Media Player and a download service in the US but there's no sign of it coming to the UK. Clearly, Netflix wants to fill the void. Hunt said: "It's going to take a while until there is a material catalogue in 4K, [so] it's important for us to get out front and begin to push it. "We've got the original content production on one end, and we're closely working with the CE manufacturers on the other end, and we've got the whole delivery pipeline in between." And there's more to Ultra HD than just the extra resolution, adds Hunt: "4K TV isn't just about cramming in the pixels. "Ultra HD is really three things; more pixels, the 4K by 2K screens – but it's also the higher frame rate (HFR) and the richer colour space. It's our intention to work with some next-round Originals to push some of those other dimensions as well. "The HFR stuff, probably for 2015, and the colour space probably for 2015 or 2016. But we intend to be pushing the envelope and being a leader in all of these new technologies, towards the ultimate Ultra HD picture in due course." How does Netflix do 4K? Our sister title Stuff.tv spoke to Neil Hunt, Netflix Chief Product Officer, to find out how the 4K streaming will work. "We're pushing forward with new encoding technology – we'll be using H.265, which is colloquially known as HEVC, instead of AVC H.264," he explains. "We think with that we're going to be delivering in the 10-16Mbps range – about 15Mbps is probably what we should think of." HEVC – or High Efficiency Video Coding – is a new compression format that can purportedly provide similar quality to the current H.264 compression standard at half the bitrate. Or, in the case of 4K streaming, provide a higher-resolution picture without a substantial step up in bitrate. Even if you don't have a 4K TV, you'll see a benefit, Hunt claims. "The benefits trickle down; we're pioneering HEVC, which is about twice as efficient as AVC. And so, when we start to see those HEVC decoders get real, and the encoders get more efficient, we're going to be able to recode all the HD content – and the standard-def content, for that matter – in HEVC," he explains. "So people with a 2 Mbps DSL will be able to receive a better picture than they do today." TVs are expected to once again be a central focus of CES 2014, with the latest UHD TVs set to dominate alongside high-resolution audio announcements.